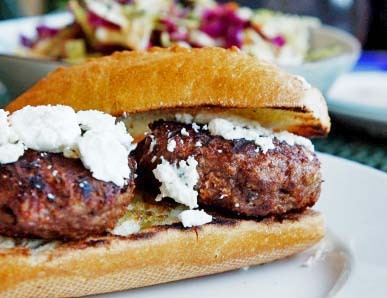 Chez Us (particularly Lenny) is hungry for a burger and not an ordinary burger such as this Chipotle Buffalo Burger with Feta Cheese, he needs something more. The search is on for the Ultimate Burger. Lenny is on a quest and he NEEDS your help! Do you have the Ultimate Burger? We challenge you to make us drool and want more! Get out there create that burger, snap a photo, write a post about it (be sure to include a link to the ULTIMATE BURGER CONTEST) and send an email with all the mentioned goodies over to the head burger master: hamburger@chezus.com. We are giving a prize for the Ultimate Burger, it is this great cookbook. “Build a Better Burger“. If you don’t have a food site or blog, then you can still email us everything minus a link to a site. We will update this post with the burgers as they come in! 17 Responses to "Ultimate Burger Contest"
Cute video but I had trouble hearing the points schedule. Coincidentally just put a burger post up called "a different burger...a different topping" so I'll send you the link via email. I have no clue i never win any of those things. but don't think about tthe whopper but think about how cool it is to win that , once again i never win those things. absolutely not! i stinking work at burger king and absolutely no one ever wins those things, i even asked my boss and he pretty much said we just do it so more people will buy food, so never sign up for those things. I've always wanted to have the perfect burger. Neither McDonald's nor Backyard Burger can fufill my wishes. My burger should be well done and flavorful. BUT it seems like they are never juicy or they arent thick enough. I want something unique yet appealing. It's a similar burger to hickory burger from Rubys and Western bacon at Carl's Jr. Or if anyone has a good suggestion for a burger, please advise.